It’s Week 5 of the Calling it Home One Room Challenge with media sponsor Better Homes & Gardens. Week 5 is the final week - the week where last minute painting, sewing, art placement, florals and photography magically come together (in my case because I burn the midnight oil once my “work work” day is done and my munchkins are in bed). For those who are new to the blog or the this challenge, please take a look at my progress so far during Week 1, Week 2 and Week 3. I missed my Week 4 blog post so I’m combining 2 into 1 today and asking for forgiveness … between my day job (which can be quite demanding), an emergency veterinary clinic visit for Mr. Finnigan Flowers, Halloween costume making, birthday parties and sleepovers it has been a busier-than-normal couple of weeks and something had to give. I also lost a significant amount of time when I bought a $40 dresser that needed to be stripped back to the original veneer. I’m happy to say that all the hard work is done with the first coat of Sherwin Williams “Argyle” green paint complete and my brother is taking it to the finish line with two more coats of paint with sanding in between. 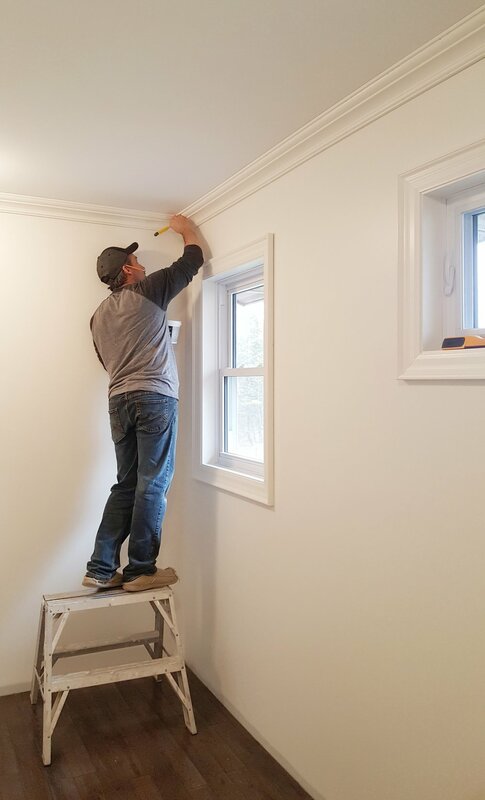 Trim and paint are complete in Audrey’s room and we started to bring in the furniture including a beautiful traditional 4 post bed from our cousin Kelly. All of the window casings are a perfect fit and slide in temporarily as the new windows will need to come out next year once new siding is installed. This was a pretty brilliant solution by my brother Paul that provides a temporary solution with a finished look. Making progress in Audrey’s room! Clark’s room is painted in Benjamin Moore’s creamy “Cloud White” and is ready for a blast of blue and green. Here is a picture of my brother Paul from Brancon touching up the crown. Antiques and vintage finds, unique florals and art are must-have final touches for every space I design. As we have two rooms to complete on a tight budget I looked for pieces that were colourful, original and varied. Enter Jenny’s Print Shop - a beautiful source for photography from the one and only Jenny Komenda and the amazingly talented artist Lynne Millar as well as collaborations from other artists. For Audrey’s room I wanted something to balance the graphic painterly pinch pleated drapes. I choose “Bougie” which was perfect on the other side of the room with the beautiful fuschia blooms. “Hills” and “Tulips” by Lynne Millar will make an appearance in the rooms as will “Cottonwood” - all from Jenny’s Print Shop. Just one week left to go and we are going to make it! I’ve called in Rowell Photography to capture all the details and I’ll be busy editing this week. I can hardly wait to share the final rooms next Thursday! If you get a chance please also take a look at other spaces by very talented designers on the One Room Challenge site.